Hey all, its the 17 of the month, and time to check yourself up. I am part of the blog hop with the CASual Fridays to remind you to check yourself against breast cancer. My card is all pink this time. 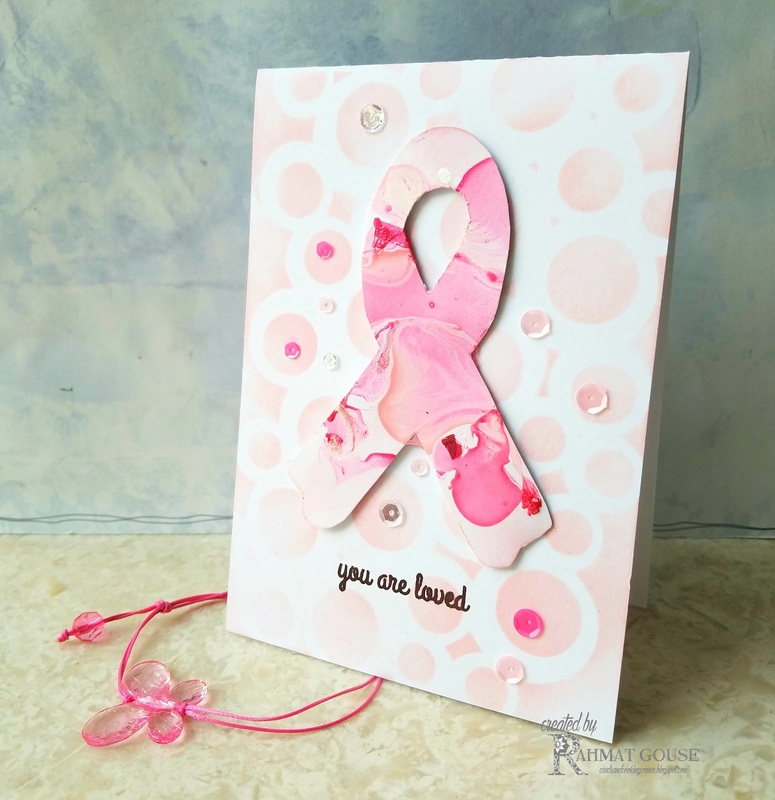 I used the hope ribbon stamp, and traced it on a card strip and fussy cut. Then did the nail polish marble for that. It is the same ribbon, which I shared in my previous nail polish marble on cards. It was suppose to be used in January, but I changed my mind and made the hope necklace. Anyway, I used the ARTplorations bubble stencil to sponge the background using SU - pink pirouette ink. The ribbon is added using a foam adhesive. I wasn't able to use the sequins last month, as the mail was still on its way. SO I have used these sequins for this month. The sentiment is also from the same set from CASual Fridays as the ribbon. I hope you do check yourself up. Your next stop is Kimberly Rendino. I love how your Hope ribbon looks! I love the way the pinks all swirl together! Beautiful card! I love your beautiful marbled Hope ribbon! It turned out gorgeous and it really stands out on your card. Love your background with the sequins! That is such a creative way to get your ribbon! Thanks for sharing, Rahmat! I love the marbled look and bubbly background. Thank you for being a part of the Calling All Sistahs blog hop! and the marbling on the ribbon. A perfect card for any female friend, even as a nice reminder! This is very cool... lots of visual interest for a pretty CAS card! i LOVE how your nail polish marble turned out! This is a gorgeous, cheerful pink color and it looks amazing! Love the marble effect! Pretty card! Love love LOVE that marbling look on your hope ribbon! I want to do some more but have to wait till my hubby leaves on a business trip as he hates the smell in the house! Lol! Nice technique. I haven't seen that before.